Racist anti freedom and liberty at work in Cheyenne! Dear Supporter of Liberty and Freedom! Urgent, a so-called — Right Wing Extremist police training — in Cheyenne Tomorrow, your calls are need immediately.A radical anti-gun group “The Anti-Defamation League” (ADL) has been invited to Wyoming by Cheyenne’s Police Chief. This training is conveniently packaged in an all too familiar “hate crime” scenario. Here is the info from Cheyenne PD. Of course the ADL’s gun control agenda is well documented and the organization has a long history of demonizing law abiding gun owners like you and me. The federal government and the states should recognize the importance of maintaining bans on the use or caching of weapons by domestic extremists. In addition, the federal government and the states should ensure that common-sense restrictions on firearms in schools and government buildings continue. In short, making it more difficult to obtain firearms – through mechanisms such as increased waiting periods, limitations on purchases, and promoting stricter gun safety, licensing, and registration laws – will help safeguard our communities …It’s a simple strategy, that anyone that possesses and uses scary guns must be a domestic extremist. The late Aaron Zelman was the founding director of JPFO, and he has exposed the ADL for its gun control shenanigans more times than I can remember. Like in this JPFO Alert when the ADL listed the famous Knob Creek Machine Gun Shoot in Kentucky as an “Extremist” event. You read that right…a twice a year family event where shooting “legal machine guns” is considered a “Domestic Extremist” event by the ADL! And as you probably guessed by now Cheyenne’s chief is also a ‘documented’ gun grabber — in fact just this year Cheyenne Police Chief Brian Kozak testified against a bill introduced by pro-gun champion Representative Allen Jaggi. This WyGO supported legislation HB-103 would have enforced Wyoming’s current preemption law — which stops cities from enacting gun control that would create a “patchwork of ordinances” across our state. In open committee Chief Kozak argued that the city of Cheyenne has the “right” to impose gun control on the citizens. The chief has hailed ADL’s extremist advanced training as, and I quote- “one of the best trainings of my 28 years in law enforcement”. It has become obvious that the chief has long forgotten that he is a public servant and that Obama style gun control isn’t on the average citizens list of things to do in Wyoming. 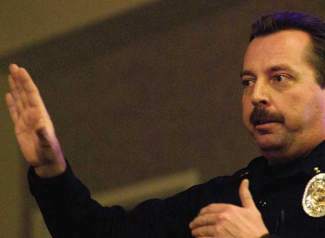 Please contact the Cheyenne Police Chief — Brian Kozak — and demand that this so-called “Right Wing Extremist Training” by a radical anti-gun activist group is called off! P.S. Cheyenne police chief has invited a known gun control advocacy group to indoctrinate the troops. Call chief Brian Kozak at (307) 637-6500 and let him know you don’t appreciate him inviting his anti-gun pals to Wyoming. If you would like to help fight against ALL gun control schemes, and expose public officials that pal around with gun-grabbing lobby groups, then please consider donating to Wyoming Gun Owners today. Barack Hussein Obama IS that failure of leadership, and he is right, Americans DO deserve better. Pass it on ’til eternity… It was so nice of him to give us this great quote for posterity! SO, USE IT! The following was sent to me via email, I have no link to it for citation, so please, just take it as it is written and if you agree, fine, if not, oh well, I am tired of arguing with the BRAIN DEAD of America. Well, I have done it! I have read the entire text of proposed House Bill 3200: The Affordable Health Care Choices Act of 2009. I studied it with particular emphasis from my area of expertise, constitutional law. I was frankly concerned that parts of the proposed law that were being discussed might be unconstitutional. Once again, a Texan is speaking the truth, and another Texan, yours truly, is spreading the word and fanning the flames. “All of us “old farts”.